What is Ultra High Vacuum? Pumping There is no permanent vacuum at the UHV level so one must have a method to continually evacuate gases from the sources below. Leaks The seals on your chamber are unlikely to be absolutly hermetic. Cleanliness Fingermarks ('organics'), or residual cleaning fluids, will decompose and outgas for a very long time. Outgassing Gases trapped within the chamber walls will eventually enter the chamber along a concentration gradient. Permeation Like outgassing, but from the external atmosphere, gases will pass through the chamber walls (especially glass). To make things difficult for ourselves, we have set the goal to develop chambers with microlitre volumes (the atom cloud has a volume ~1 microlitre) which maintain a vacuum of 10-10 mbar for 1000 days (typical service life of ~3 years) with no active pumping. This last restriction may seem to contradict the first point in the above UHV hurdles, but what we mean is that the pumping mechanism requires no power, so passive pumps are allowed. So why set this challenge? UHV systems are the bulkiest apparatus of cold atom systems, typically having volumes of several litres and consuming hundreds of Watts of power continuously. All this to manipulate a cloud of atoms smaller than a pin head. Admittedly, in some cases large vacuum chambers are justified (for example in atomic fountains), but in most schemes the atoms may move less than a centimeter. If we can miniaturize this system then we have not only made the leap to practical cold atom devices, we can also make the optics simpler, reduce power consumption in external magnetic coils, improved detection efficency of the atoms (greater solid angle) and also made magneto-optical traps cost effective and mass-producable. Our microlitre chips are primarily constructed of Silicon and Aluminosilicate (AS) glass as both have extremely low outgassing and permeation rates, they can be bonded together to form extremely low leak rate seals, and they have similar thermal expansion coefficients reducing the risk of stress fractures during bonding. Non-evaporable getters (NEGs) are elements, or alloys, or Group IV/V metals which form strong chemical bonds with most gases found in UHV: Hydrogen, Carbon Monoxide, Nitrogen and Water. After exposure to large mounts of these gases the surface become saturated and pumping stops. the NEGs can be re-activated by heating to 200-800C (depending on the alloy) during which the reacted gases are absorbed into the bulk leaving a fresh pumping surface. 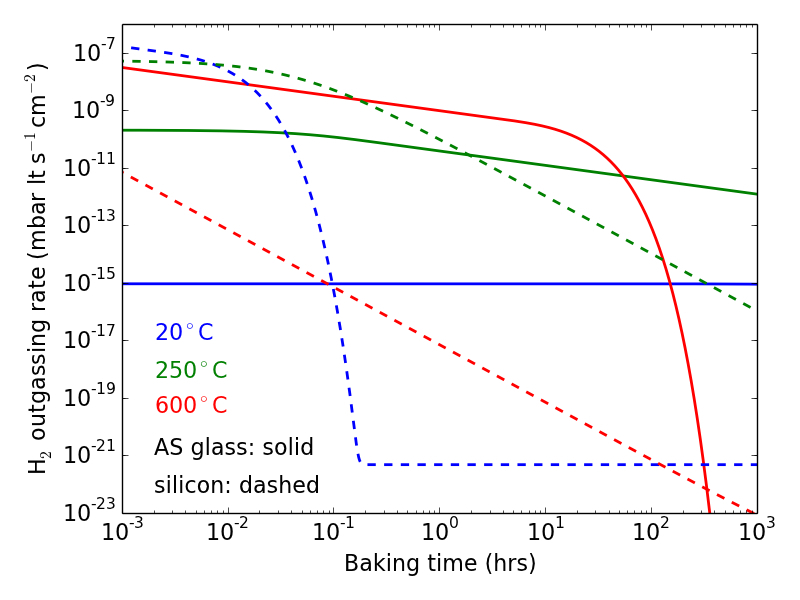 The graph to the left shows the effect on outgassing rate of Hydrogen from silicon and aluminosilicate glass (AS) after vacuum baking. This process is necessary to obtain the very low outgassing rates necessary for UHV and for our chips we aim for below 10-16 mbar lt s-1 cm-2. Higher baking temperatures increase the diffusion of gas species through the bulk and desorption from the surface. We see here that both silicon and AS glass have a very low rate at room temperature and requires only mild baking for a day or so. Permeation of Helium through various glasses. NEGs do not pump noble gases and so the UHV chambers must be completely impermeable to them. The atmosphere contains Argon, Neon, and Helium, in order of concentration. However, permeation depends on the size of the molecule and it turns out that Helium permeation is the greatest risk to vacuum. 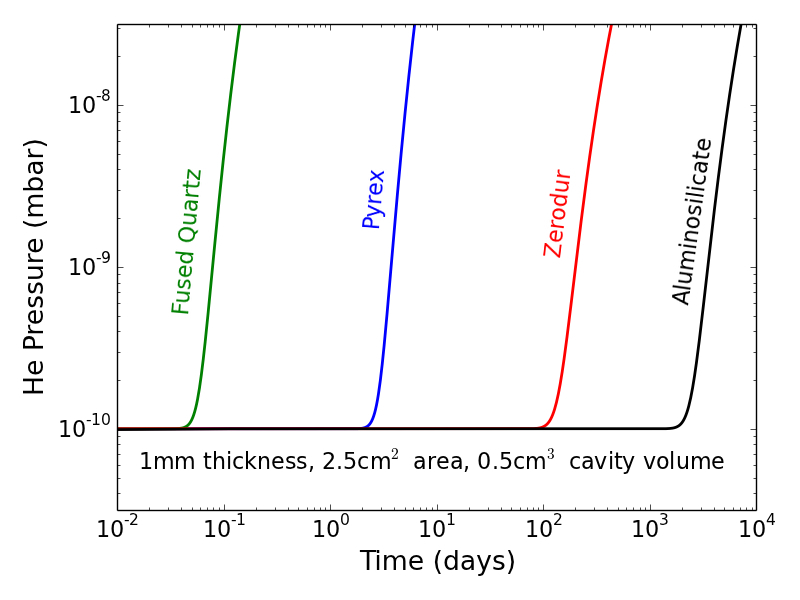 We can see in the graph on the left that it will reduce the vacuum in less than a few days with Fused Silica and Pyrex. Schott Zerodur, a glass ceramic, and AS glass show superior properties due to how their chemical composition act to seal the permeation routes. 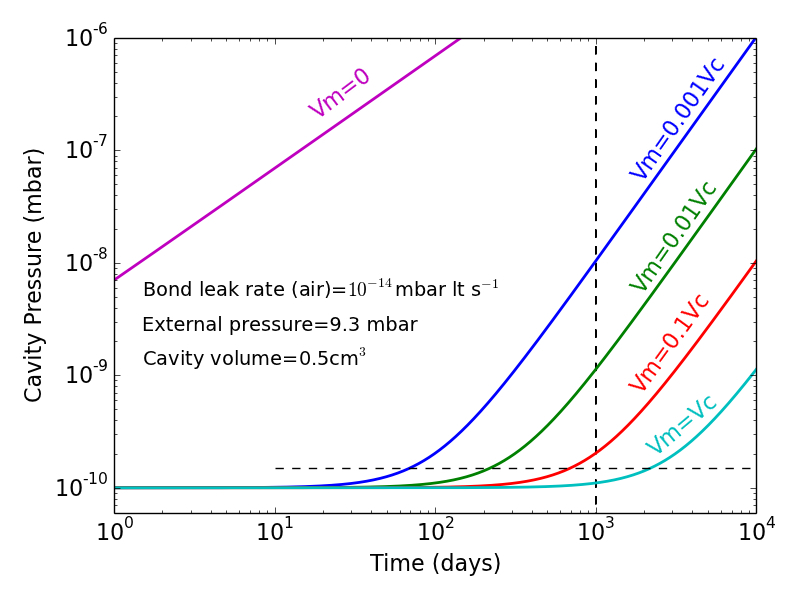 The effect of an interseam cavity on leak rate. Leak rates, especially very low ones, are difficult to measure due to the long timescales and difficulty in getting probes inside microlitre chips. Nevertheless, various studies have shown that Glass-silicon bonding can achieve extremely low rate. Unfortunately the measured rates are not enough for our chips and so we have implemented a type of 'double glazing seam' into our chips in the form of an evacuated cavity, or moat. The leak rate is proportional to the pressure difference across the seam, so by having a vacuum between seams the rate is drastically reduced. How empty are your chambers? At the moment we are still fabricating the chips so we cannot give a solid answer to the internal pressures, nor lifetime. Also, measuring UHV inside microlitre chambers is not trivial and we aim to use the lifetime of the atoms within the MOT cloud to do just that. Using realistic values for outgassing, leak, permeation and pumping rates we have found that the chips could maintain a vacuum below 10-10 for nearly 10 years. Moreover we may have vacua a few orders of magnitude lower than we require due to the very low outgassing rates. Ultimately the pressure will be limited by residual noble gases in the bonding chamber to around 10-12 mbar.